Scientology, Tom Cruise, and the Making of Spielberg's "War of the Worlds"
Cruise: I believe in freedom of speech. I felt honored to have volunteer Scientology ministers on the set. They were helping the crew. When I'm working on a movie, I do anything I can to help the people I'm spending time with. I believe in communication. SPIEGEL: The tent of a sect at someone's working place still seems somewhat strange to us. Mr. Spielberg, did that tent strike you as unusual? Spielberg: I saw it as an information tent. No one was compelled to frequent it, but it was available for anybody who had an open mind and was curious about someone else's belief system. Cruise:The volunteer Scientology ministers were there to help the sick and injured. People on the set appreciated that. I have absolutely nothing against talking about my beliefs. But I do so much more. We live in a world where people are on drugs forever. Where even children get drugged. Where crimes against humanity are so extreme that most people turn away in horror and dismay. Those are the things that I care about. I don't care what someone believes. I don't care what nationality they are. But if someone wants to get off drugs, I can help them. If someone wants to learn how to read, I can help them. If someone doesn't want to be a criminal anymore, I can give them tools that can better their life. You have no idea how many people want to know what Scientology is. SPIEGEL: Do you see it as your job to recruit new followers for Scientology? SPIEGEL: With all due respect, we doubt that. Mr. Cruise, you made studio executives, for example from Paramount, tour Scientology's "Celebrity Center" in Hollywood. Are you trying to extend Scientology's influence in Hollywood? Cruise: I just want to help people. I want everyone to do well. Spielberg: I often get asked similar questions about my Shoa Foundation. I get asked why I am trying to disseminate my deep belief in creating more tolerance through my foundation's teaching the history of the Holocaust in public schools. I believe that you shouldn't be allowed to attend college without having taken a course in tolerance education. That should be an important part of the social studies curriculum. SPIEGEL: Mr. Spielberg, are you comparing the educational work of the Shoa Foundation with what Scientology does? Spielberg: No, I'm not. Tom told you what he believes in, and after that I told you what I believe in. This is not a comparison between the Church of Scientology, the Shoa Foundation and the Holocaust. I was only showing you that some of us in Hollywood have set out to do more than just be actors or directors. Some of us have very personal missions. In Tom's case, it's his church, and in my case, it's the Shoa Foundation, where I'm trying to help other people learn about the mortal dangers of pure hatred. SPIEGEL: How do you set about doing that? Spielberg: I think that the only way we're going to teach young people not to kill each other is by showing them the reports by the survivors of the Holocaust -- so that they can tell them in their own words man's inhumanity to man. How they were hated. How they were displaced from their homes. How their families were wiped out and how by some miracle they themselves survived all that. Cruise: How did the Holocaust start? People are not born to be intolerant of others. People are not born bigots and racists. It is educated into them. Spiegel: Mr. Cruise, as you know, Scientology has been under federal surveillance in Germany. 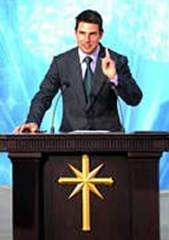 Scientology is not considered a religion there, but rather an exploitative cult with totalitarian tendencies. Cruise: The surveillance is nothing like as strict anymore. Any you know why? Because the intelligence authorities never found anything. Because there was nothing to find. We've won over 50 court cases in Germany. And it's not true that everyone in Germany supports that line against us. Whenever I go to Germany, I have incredible experiences. I always meet very generous and extraordinary people. A minority wants to hate -- okay. SPIEGEL: There is a difference between hate and having a critical perspective. Cruise: For me, it's connected with intolerance. SPIEGEL: In the past, for example when "Mission: Impossible" (1996) came out, German politicians called for a boycott of your movies. Are you worried that your support for Scientology could hurt your career? Cruise: Not at all. I've always been very outspoken. I've been a Scientologist for 20 years. If someone is so intolerant that he doesn't want to see a Scientologist in a movie, then he shouldn't go to the movie theater. I don't care. Here in the United States, Scientology is a religion. If some of the politicians in your country don't agree with that, I couldn't care less. Spiegel: Do you think "War of the Worlds" is a religious movie? H.G. Wells praised the wisdom of the creator for creating even bacteria, because in his story the microbes are the ones who finally finish off the aliens. The 1953 movie version even moved the final showdown inside a church. Spielberg: I think people will either find their personal beliefs confirmed, or they won't. But in particular, they'll be scared and duck under their seat and say afterwards that it was a great experience. We both consciously decided not to end this movie inside a church, a synagogue or a mosque. Cruise: It's simply not that kind of story.